...... Remotely erase sensitive and confidential information in realtime including; Contacts, Categories, E-mails, Phone Logs, Events, Memos, To Do Lists, and Home User Subfolders. 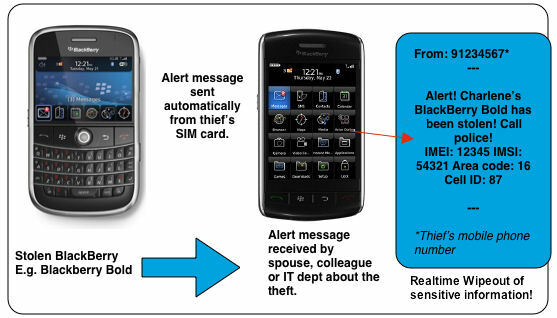 As soon as an unauthorized SIM card is inserted into the stolen or lost BlackBerry, an SMS text alert and e-mail is sent to a pre-determined number/e-mail address (e.g. spouse, colleague, IT dept) The message is sent from the thief's own phone number and includes IMEI & IMSI information to help in recovery of your BlackBerry. -Set the software to send repetitive alerts via SMS Text Alert every minute in the background. -Stop your stolen BlackBerry from accessing the network using IMEI detection, a number unique to every GSM phone used by the GSM network to identify valid devices. -Get the location of the thief by capturing information about your BlackBerry's location (area code and cell ID) sent via SMS text alert when the thief changes the SIM Card. Qweas is providing links to PhoneBAK BlackBerry 1.01 as a courtesy, and makes no representations regarding PhoneBAK BlackBerry or any other applications or any information related thereto. Any questions, complaints or claims regarding this application PhoneBAK BlackBerry 1.01 must be directed to the appropriate software vendor. You may click the publisher link of PhoneBAK BlackBerry on the top of this page to get more details about the vendor.